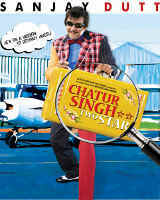 Chatur singh two star is a story revolving around Chatur Singh (Sanjay Dutt) on his way to complete a secret mission. Of course, He is infamous in the mumbai police department for the sheer level of stupidity and overwhelming idiocy he is possessed with. But in his eyes and in the eyes of his Pappu Panther (Suresh Menon), Chatur Singh is brave, angry, stylish, powerful, genius, extraordinary, etc. Sonia (Ameesha Patel) helps him in the mission as she is really intelligent but Chatur Singh keeps landing in trouble which creates trouble for others also. Somehow, he stumbles onto right clues be it luckily. But he is chatur singh, the cop with two star, and so he is the biggest problem between himself and the mission success. He creates confusion, drama, hilarious accidents and lot more. The movie is full of hilarious events which might bring you down on the floor, yet you won’t be able to control your laughing. More awaits. Watch this movie in theatre when it is released and comment your reviews here about all details including synopsis, acting, fun!